In the village where the great zen master Haukin was living, a girl became pregnant.He father bullied her for the name of her lover, and, in the end, to escape punishment, she named Haukin. The father said no more, but when the time came and the child was born,he at once took the baby to Haukin and threw her down. "It seems that this is your child,"he said, and piled on every insult and sneer at the disgrace of the affair. Haukin only said, "Oh, is that so?" and took the baby in his arms.Wherever he went thereafter, he took the baby, wrapped in the sleeve of his ragged robe.During rainy days and stormy nights, he would go out to beg for milk from the neighboring houses.Many of his disciples, considering him fallen, turned against him and left. And Haukin said not a word. Meantime, the mother found could not bear the agony of separation from her child.She confessed the name of the real father, and her own father rushed to Haukin, and prostrated himself,begging over and over for forgiveness. Haukin said only, "oh, is that so?" and handed the baby back. In today's world, we worry about what others say and think of us too much.All we remember is a collection of other people's opinions about ourselves.Therefore, we are very careful not to do anything "socially wrong", lest it changes their views and perceptions. 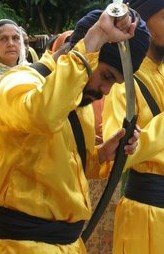 We try to fit into the "norm", so as to speak.For this, we would even turn our backs on our beloved gurus and gursikhi. Cutting our hair, refraining from gurudwara visits,smoking and drinking,going to clubs,dressing up "funny", excess make-up and skimpy attire for the sisters.Even up to the point that, if we are out with our friends, and we bump into an "un-cool" relative, a nerdy friend, or some giani ji who has lost his way, we pretend to ignore em, lest our "friends" build up a "negative" opinion about us.We depend on what people think or say about us so much, that we dont even know who we are anymore.We have lost the very essence of our purpose on earth, truthful living. 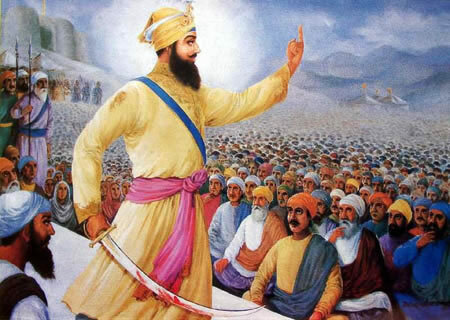 Few hundred years later, Guru Gobind Singh ji, brought it into practise, when he asked for a head to be sacrificed.The symbolic meaning of which is, you are dead to the world now, and your head belongs to the guru.You are to walk this path of truth righteousness as a khalsa, ignoring all other worldly illusions. A gursikh has no need of other's opinions. He knows himself, he knows what he is doing, and he does not need others to say.Even if the world were to go against what he is doing, he would simply laugh.He knows the truth.They who condemn him, don't. He wont make any "efforts";waste of his time, to change others' opinions about him.Who are they anyways?They who dont know themselves, are trying to label him. Waheguru ji ki Fateh hai ji!!! Im finding the proper answer of this-> Please tell why some nihung singh made bali of goat or any other animal? what is the reason behing this?